“Autoimmune disease is an epidemic in our society. By now, most of you have heard of the Paleo Approach. For those of you who haven't, it's the most comprehensive book ever written on the topic of reversing autoimmune disease. Seriously, I'd call it the autoimmune bible. 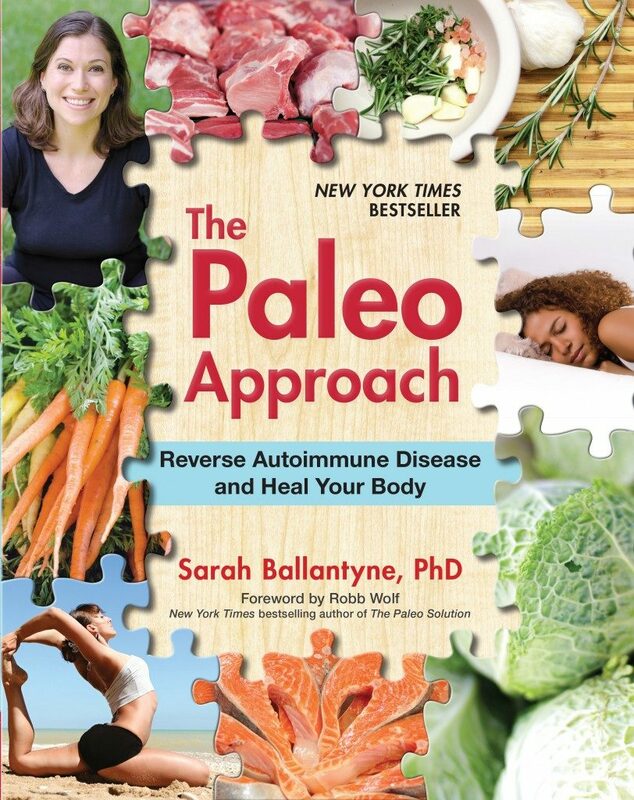 The author is Sarah Ballantyne, Ph.D., also known as the Paleo Mom. She's a research scientist specializing in inflammation and immunity, and she has an autoimmune disease herself, making her uniquely qualified both personally and professionally to write a guide to healing. 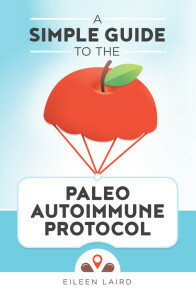 Her focus is the Paleo Autoimmune Protocol (AIP). The first thing you'll notice is that it's gorgeous. It's full of colorful graphs, photos, illustrations and textboxes that summarize and accentuate the information contained in the text. It's functional. The front and back covers have foldover flaps for you to use as bookmarks. Color coded corner tabs let you flip through the book quickly to find information. Every chapter ends with a review page that highlights the most important points covered in that chapter. There's an index, a glossary, and detailed food guides, including vitamin, mineral and amino acid profiles of hundreds of different whole foods. This book was designed to be a reference book you can use daily to find the answers you need. It's impressive. The leading names in the paleo movement have all endorsed this book. Robb Wolf wrote the forward, and the back cover is filled with praise from Dr. Davis, Dr. Kharrazian, Dr. Wahls, Paul Jaminet, Diane Sanfilippo, Melissa Hartwig and the Caltons. It's personal. Interspersed throughout the scientific text are personal testimonials of real people, like you and me and the author herself, who have all used the Paleo Approach to heal. It's in depth. No matter how much you know about autoimmunity and nutrition, you'll find new information in this book. Even experts in the field will learn something. 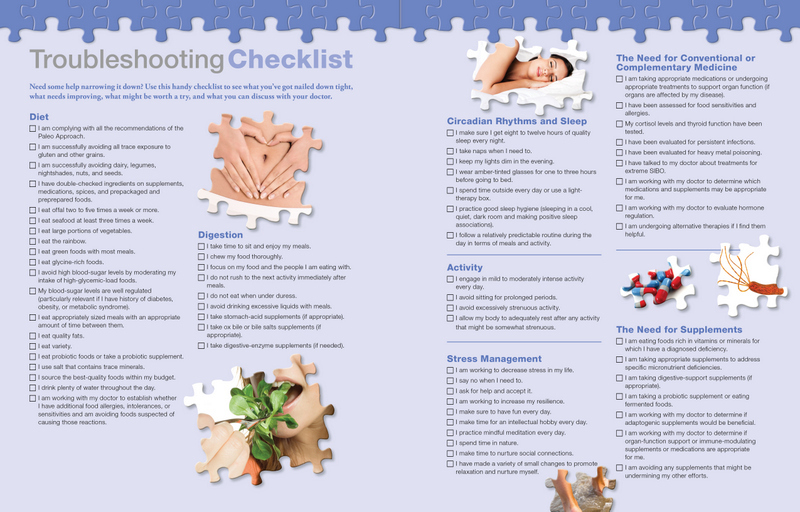 My favorite section, if I had to pick one, is the Troubleshooting Checklist. It's a list of questions to ask yourself if you aren't seeing improvements after 3 months on the protocol. Sarah was kind enough to let me include it here. Added Sugars: In the book, Sarah has a new category on the “Foods to Avoid” list, called “Added Sugars” and includes everything from high fructose corn syrup to raw honey. However, in her “Foods to Eat” list, she includes honey, maple syrup and molasses as pantry items. I asked her to clarify, and she said, “This is an acknowledgement to the fact that we are all human and there are times when a special treat can make all the difference in the world in terms of sustainability. So, it's a list of best choices if you are going to have a treat. The number one factor in determining how much can be used is maintaining blood sugar regulation, which will depend on other foods being consumed and the individual's sensitivity. The number one factor in determining frequency is how the individual's body responds to those treats.” In other words, avoid added sugars as part of your daily diet, and pay attention to your body when deciding how often to include treats in your life. Wiggle Room: While Sarah Ballantyne believes the full Paleo Approach is the quickest path to healing, she understands that some people might find it intimidatingly restrictive. With that in mind, she has identified a list of foods that are least likely to be problematic for people with autoimmune disease. These are the foods she recommends reintroducing first. Or if you need a bridge between regular paleo and strict AIP, these are the foods she feels are safest to continue eating during that transition: fresh legumes (green beans and peas), fruitbased spices, seedbased spices, seed and nut oils, ghee from grass fed dairy, and egg yolks. Stage 4 Reintroductions: You might be surprised to see this category in the book, because it lists foods that aren't paleo as possible reintroductions in the future, including soaked and fermented legumes, and soaked and fermented grains. These would be considered Weston A. Price foods, and Sarah explains their inclusion in the book as foods people who eat an 80/20 version of paleo might include as part of their 20% flexibility. She doesn't necessarily recommend people with autoimmune disease reintroduce these foods at all. They're listed as one of the last reintroductions accordingly, and should only be tried if all other reintroductions have succeeded and your autoimmune disease has been in remission for a long time. If I Could Add One Thing: Honestly, this book is amazing and there's very little to critique. If I was given one editing wish, I would add a 1-page quick summary of the protocol at the start of the book. Something you could cut out and stick on your fridge as a reminder. Handling the Stress Factor: If you're new to the paleo autoimmune protocol, reading the book can be overwhelming. It's a challenging program, but Sarah helps by offering options for transitioning into the protocol – either going “all in” or taking it one step at a time, and she gives suggestions for baby steps. She also has a big section on lifestyle factors, such as reducing stress and getting more sleep. Those factors are essential in healing, but they're also excellent tools to take care of yourself as you do the protocol itself. Use them! How many times did you attempt the Paleo Approach before successfully completing a strict elimination period, without cheats? When I first started, there was almost no information out there about why's behind Paleo Approach eliminations and even a lot of conflicting information on exactly what to eliminate. There was also no information whatsoever on what superfoods to eat more of and zero information on the importance of lifestyle factors. That lack of information really slowed me down in my own implementation. It took me about four months to realize that I should eliminate coffee, that paprika was a nightshade, and I lived in denial about needing to cut out chocolate for months. From the time I decided I needed to modify a paleo diet for my autoimmune disease to when I really understood exactly what the Paleo Approach meant was about 10 months (although, I figured out the elimination piece at about the 4 month mark and did see improvement then). It wasn't so much about falling off and getting back on the wagon, so much as discovering what exactly the wagon was in the first place! And of course, this experience was one of my main motivators for writing The Paleo Approach. Now, the information is compiled and set out for others to follow without the dragged-out process of accumulating knowledge that I had to go through. What foods have you been able to successfully reintroduce, and how long did that take? I have successfully reintroduced grass-fed ghee, soy-free pasture-raised egg yolks, and most seed-based spices. I do okay with small and occasional amounts most nuts, seeds, egg white, and coffee, but definitely reserve these for very occasional treats and only when my stress is well managed and I'm getting enough sleep. It took almost a year from when I had the Paleo Approach nailed down to when I could consume these foods without problems. The book is an incredible gift to the community, but came with a sacrifice: the work it entailed caused your autoimmune disease to flare. What steps have you taken to regain your health? The biggest thing I've been focusing on is sleep. I've also been carving out more time for stress-management activities, including walks and strength-training classes. I also opted to delay the release of The Paleo Approach Cookbook so that I could slow my pace a little to look after myself better. What is the most challenging aspect of the Paleo Approach, for you personally? Page 246. “It's okay to say no.” I'm terrible at saying no and have a bad habit of overcommitting myself. This has the snowball effect of increasing my stress and decreasing the amount of time I can commit to stress-relieving activities and sleep. The winner was chosen with a random number generator on 2/7/2014. Congratulations to Flavia Gomes! If you didn't win, don't despair. The book is reasonably priced and worth every penny. You can purchase a copy here. Now, I have a free copy of this awesome book to give to one of you! Entering to win is easy. Either “like” my page on Facebook or subscribe by email to my blog. (You can do either via my blog’s sidebar to your right, or if you’re on a mobile phone, I believe the sidebar shows up at the bottom of the page.) When you’ve done that, simply leave a comment below, letting me know which one you’ve done. I've decided to open this giveaway up to the whole world, so even if you live outside the U.S., you're welcome to enter. The winner will be randomly chosen on February 7, 2014. Good luck! Disclaimer: I was given a review copy of the book as well as a copy to give away, with no obligation. I'm 100% honest in my opinions. If I didn't love this book, I wouldn't have written the review, nor hosted the giveaway. As proof, I'm putting my money where my mouth is; this book is heavy! Sarah donated the book, but I'm donating shipping, and I'll ship anywhere in the world that the winner lives.